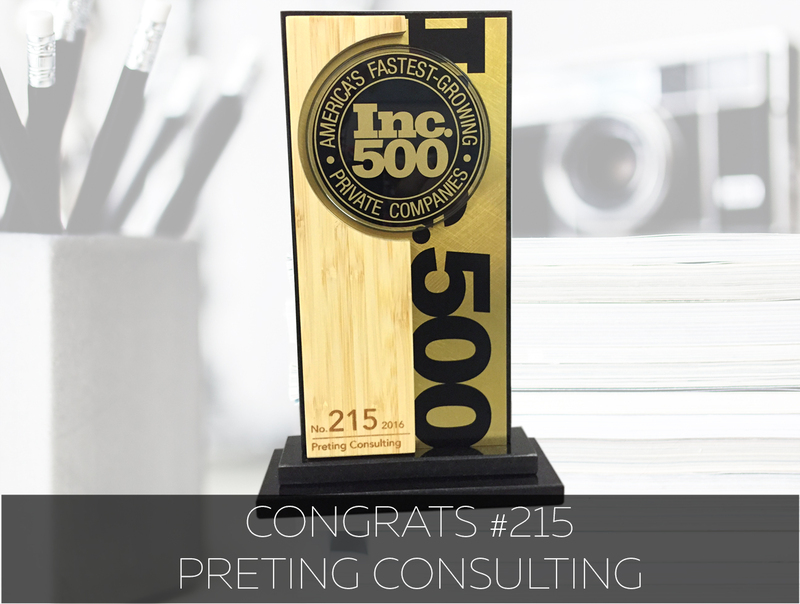 Alexandria, VA—Preting Consulting, providing expertise in the areas of business modeling and business design services, training and education services, and assessment and selection services, was recently ranked #215 on Inc. magazine’s Inc. 500 list. In its 35th year, Inc. 5000 is the most prestigious ranking of the nation’s fastest-growing private companies. The Inc. 500 are the top 500 companies out of the 5,000 recognized on the list. The list represents a unique look at the most successful companies within the American economy’s most dynamic segment—its independent small businesses. Preting joins companies such as Microsoft, Dell, Domino’s Pizza, Pandora, Timberland, LinkedIn, Yelp, Zillow, and many other well-known names that gained their first national exposure as honorees of the Inc. 5000. Preting was ranked as #215 due to its impressive three-year growth of 1,827%. Additionally, Preting holds the #12 position for government service companies, #12 overall in Virginia, and #15 overall in the Washington DC area. Founded in 2011, Preting’s annual revenue is $5.2 million. As well, 98% of Preting’s team members are veterans. Preting Consulting is a privately owned company founded in 2011 by a mix of national security professionals who have extensive experience protecting vital interests. We combine the ingenuity of the intelligence community with the flexibility and innovation of the commercial sectors to provide you with insightful, forward-focused solutions. Preting gravitates towards “niches” and specialized markets, where we have built strategic partnerships, resulting in an unprecedented range of expertise to ensure the best possible scenario for your company. Preting offers business modeling and business design services, training and education services, and assessment and selection services through the use of ASEelite™. For more information, visit www.preting.com.